The Los Angeles County Regional Planning Commission will conduct a public hearing to consider the project described below. You will have an opportunity to testify, or you can submit written comments to the planner below or at the public hearing. If the final decision on this proposal is challenged in court, testimony may be limited to issues raised before or at the public hearing. 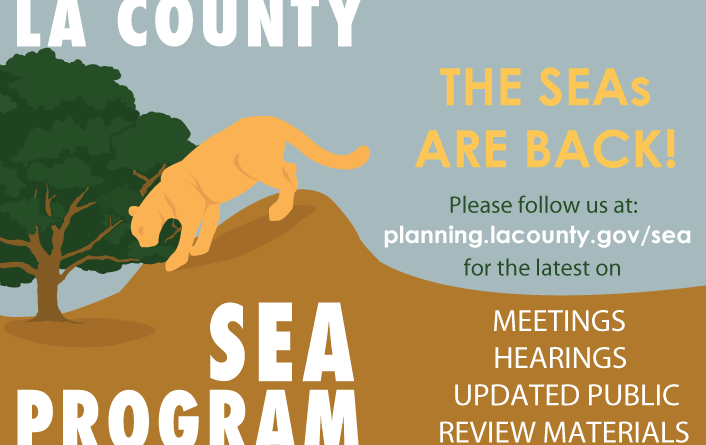 Hearing Date and Time: Wednesday February 27, 2019 at 9:00 a.m.
Environmental Documentation: Class 8 – Actions by Regulatory Agencies for Protection of the Environment (SEA ordinance) and Addendum to Certified Final EIR Project 02-305 Los Angeles County General Plan (Conceptual SEAs). Project Description: The Conceptual SEAs project is an amendment to the General Plan to remove all text references to “Conceptual SEAs” and amend Figure 9.3 to designate the Altadena Foothills and Arroyos and the Puente Hills “Conceptual SEAs” as official “SEAs” and subject to the SEA Ordinance. General Plan Implementation Program C/NR-2 SEA Ordinance will make changes to the SEA ordinance in Los Angeles County Code Title 22, which regulate permitting, design standards, and the review process for development within SEAs. For more information regarding this application, contact Iris Chi, Los Angeles County Department of Regional Planning (DRP), 320 W. Temple St., Los Angeles, CA 90012. Telephone: (213) 974-6461, Fax: (213) 626-0434, E-mail: ichi@planning.lacounty.gov. Case materials are available online at planning.lacounty.gov/site/sea/meetings or at the East Los Angeles Library (4837 E. 3rd St., Los Angeles, CA 90022), Graham Library (1900 E. Firestone Blvd., Los Angeles, CA 90001), Topanga Library (122 N. Topanga Canyon Blvd., Topanga, CA 90290), Hacienda Heights Library(Steinmetz Park, 1545 S. Stimson Ave., Hacienda Heights, CA 91745), Rowland Heights Library (1850 Nogales St., Rowland Heights, CA 91748), Altadena Library (600 E. Mariposa St., Altadena, CA 91001), Acton Agua Dulce Library (33792 Crown Valley Rd., Acton, CA 93510), Lake Los Angeles Library (16921 E. Avenue O, #A, Palmdale, CA 93591), and Lancaster Regional Library (601 W. Lancaster Blvd., Lancaster, CA 93534). All correspondence received by DRP shall be considered a public record. If you need reasonable accommodations or auxiliary aids, contact the Americans with Disabilities Act (ADA) Coordinator at (213) 974-6488 (Voice) or (213) 617-2292 (TDD) with at least 3 business days’ notice. Si necesita más información por favor llame al (213) 974-6427.